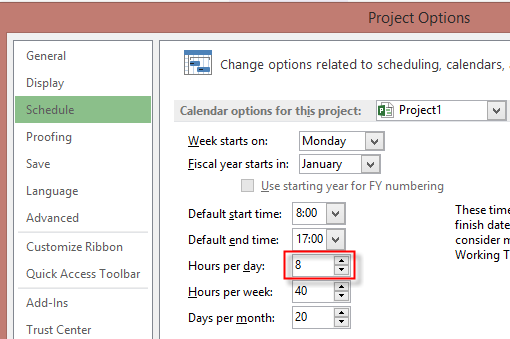 Duration, Units, Work and Schedule in MS PROJECT 2013. How are they linked, and some tips and tricks! Glad to find your site and I thought of requesting your assistance ! It would be great, if you clarify my queries on below! I have a question on below issue ! Hope I will get assistance on how to get the desired result! In Below Scenario, i am trying to face a situation which i could not solve! Need to create a task “Paint the wall”. I would expect this task to be completed by 24 hours. I have 3 resources with below constraints. I would like to implement the above in Project 2013, such that, resources are effectively utilized such that, we can complete this task (“paint the wall”) with less number of days ! If I assign Resource A, B and C, I would expect the work (24 hours) to be completed by Jan 9th. 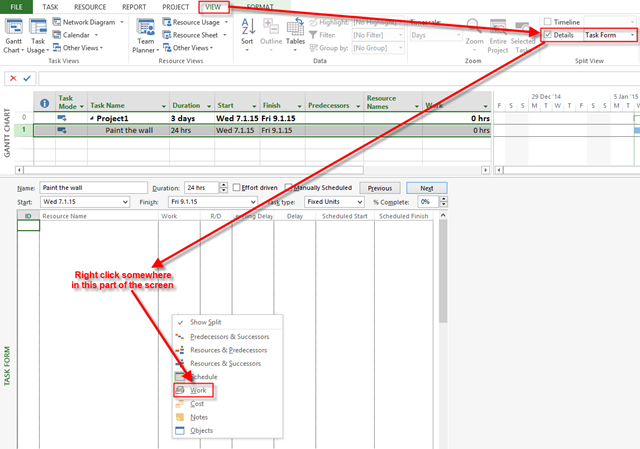 Requesting your assistance on how the above can be done in ms project 2013. As I could not get the expected result of above case !! OK! Let’s go with MS PROJECT PRO 2013! Notice that in first picture Work field is 0 hours! Is that a Bug? Not at all! Work field will have value greater than 0 ONLY when I assign resources on it. Without Resources it will always be 0! And you should keep that in mind! As you can see duration is still 24 hours (3 days), but work is only 12 hours! Is this a Bug? NOT AT ALL! The Magic formula (and I wrote about it a lot) is WORK = DURATION * UNITS And that explain this result. So Work = 24 hours * 50% = 12 hours. And That means that Resource A will work 3 days, 4 hours per day. In other words, Resource A will finish this 3 day work in 12 hours! As you can see duration is now 6 days, because Resource A will work 24 hours, 4 hours per day, e.g. 24/4 = 6 days duration! On Jan 9th, 2015 – Since resource3 can’t work, Resource1 and Resoure2 will work 3+3 = 6 hrs – I will explain this expectation. Since expected duration is 24 hours, my Blog Reader expect that remaining work at Jan 9th is 24 (total) – 10 (Jan 7th) – 8 (Jan 8th) = 6 hours. And since at Friday, Jan 9th Resource C is unavailable, and other two resources are, they should split work among them. But MS PROJECT does not work that way. Instead, it will wait to Resource C to finish his/her work when he/she is available. And that is reasonable, because Microsoft Project can not “remove” work for Resource C, just because it is unavailable at some dates. 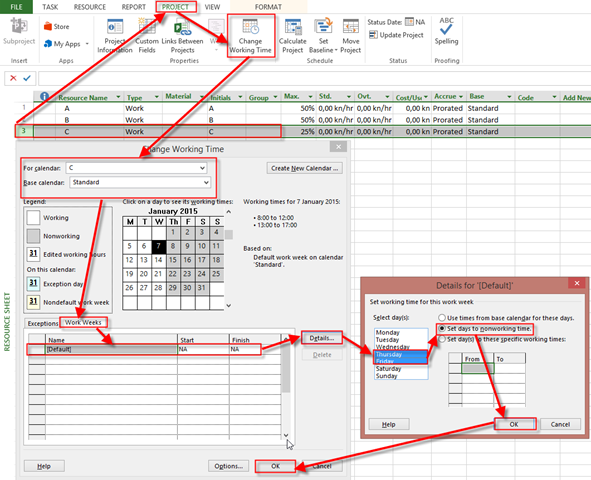 This entry was posted in MICROSOFT PROJECT, Microsoft PRoject 2010, Microsoft Project 2013, MS PROJECT 2010, PMI and tagged Microsoft Project 2010, Microsoft Project 2013, Microsoft Project 2013 - Scheduling, ms project - scheduling, MS PROJECT 2010 - Scheduling, MS PROJECT 2013 Scheduling. Bookmark the permalink. 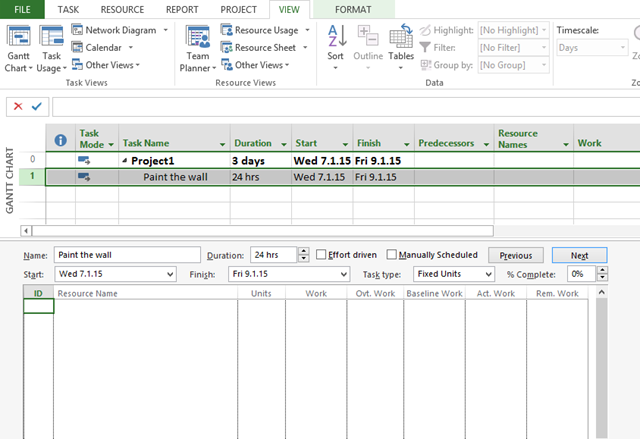 5 Responses to Duration, Units, Work and Schedule in MS PROJECT 2013. How are they linked, and some tips and tricks! I have a further question. How do I show five days work over a period of three weeks? I didn’t understand your quetion. Can you be more specific please? Thanks a Lot, Nenad.. I had this query and raised it. Never thought i would have got reply over this !! unfortunately seeing this reply after 2 yrs 🙂 Very thankful for the explanation. Hopefully i will try to simulate what is explained here ! Wow! Fantastic article Nenad. Thanks for sharing. Happened to be here while on a search regarding budgeting with MS project. Your tips and presentations are really useful and tempting to learn more. HAPPY NEW YEAR ! !